Winter can put a damper on driving conditions, especially when snow and ice are involved. Hazardous storms and inclement weather are a factor in more than half a million crashes and more than 2,000 road deaths every winter, according to research from the AAA Foundation for Traffic Safety. 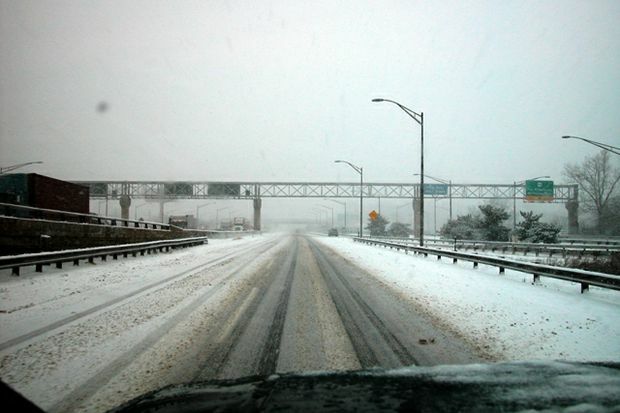 With inclement weather in the forecast, AAA urges drivers to slow down, be cautious and prepare their vehicles. Do not tailgate. Normal following distances of three to four seconds on dry pavement should be extended to a minimum of five to six seconds when driving on slippery surfaces. The extra time will provide additional braking room should a sudden stop become necessary. Never use cruise control on slippery roads. If your vehicle hydroplanes or skids, you will lose the ability to regain some traction simply by lifting off the accelerator. It will be harder to recover from the loss of traction if cruise control is active. Slow down and adjust your speed to the road conditions. Leave yourself ample room to stop. Accelerate, turn and brake as gradually and smoothly as you can. Don’t slam on the brakes. If your car begins to skid, continue to steer in the direction you want the car to go. Slamming on the brakes will only make your vehicle harder to control. Use extreme caution on bridges and overpasses. Black ice typically forms first in shaded areas of the roadway and on bridges and overpasses that freeze first and melt last. Although the road leading up to a bridge may be fine, the bridge itself could be a sheet of ice. React quickly. Watch the traffic ahead and slow down immediately at the sight of brake lights, skidding cars or emergency flashers. Have your battery tested. A AAA survey found that two-thirds of American drivers have never proactively had their car battery tested. If a battery is more than three years old have it checked by a professional to ensure it is strong enough to endure cold weather. Replace worn windshield-wiper blades. If your climate is especially harsh, purchase one-piece, beam-type or rubber-clad “winter” blades to fight snow and ice buildup. Use cold-weather windshield washer solvent and carry an ice scraper. Inspect your tires. Make sure tires have adequate tread depth – at least 4/32” – as worn tires can affect a driver’s ability to stop in slick conditions. An easy way to check for wear is by inserting a quarter into your tread groove. If the top of Washington's head is exposed, the tread depth is less than 4/32" and it’s time to replace your tires. Also, check that your car has a spare tire and keep it properly inflated in case you need it. In harsh winter climates, a set of snow tires may be a wise investment. Carry an emergency kit equipped for winter weather. The kit should include sand or kitty litter, a small shovel, flashlight, an ice scraper or snow brush, booster cables, a blanket, gloves or mittens and flares or reflective triangles. More AAA winter car care tips can be found here.